A newly-formed political advocacy group that has vowed to stop Judge Brett Kavanaugh’s confirmation to the U.S. Supreme Court is largely funded by a non-profit that has received millions of dollars from leftist billionaire George Soros, a report said. 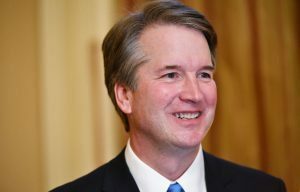 Demand Justice, which said it would pump $5 million into the anti-Kavanaugh effort, is organized and financed by a 501(c)(4) called the Sixteen Thirty Fund, which collected some $2.2 million in contributions from the Open Society Policy Center (OSPC), one of Soros’s primary donation vehicles, between 2012 and 2016, according to the Daily Caller News Foundation. Since the Sixteen Thirty Fund serves as its fiscal sponsor, Demand Justice “does not have to submit its own tax returns or disclose its supporters,” the report said. The Fund registered the trade name “Demand Justice” with the Washington D.C. Department of Consumer and Regulatory affairs on May 2. Demand Justice said it plans to run ads in Maine and Alaska, urging GOP Sens. Susan Collins and Lisa Murkowski to oppose Kavanaugh’s nomination. Collins and Murkowski are pro choice moderates who have broken with their party on Obamacare repeal and federal funding for Planned Parenthood. The Demand Justice ads urge the senators to protect abortion access by withholding support for nominees who oppose the 1973 Roe v. Wade decision.